Ebola virus disease (formerly known as Ebola haemorrhagic fever) is a severe, often fatal illness, with a death rate of up to 90% caused by Ebola virus, a member of the filovirus family. The Ebola virus can cause severe viral haemorrhagic fever (Ebola HF) outbreaks in humans with a case fatality rate of up to 90%. There are four main subtypes of Ebola virus in the African Region: Bundibugyo, Ivory Coast, Sudan and Zaire. The Bundibugyo, Sudan and Zaire species have all been associated with large Ebola HF outbreaks in the Region. Ebola HF symptoms include a sudden onset of fever, intense weakness, muscle pain, headache and sore throat. This is followed by vomiting, diarrhoea, rash, impaired kidney and liver function, and in some cases, both internal and external bleeding. The virus is transmitted to people from wild animals and spreads in the human population through human-to-human transmission. People can become exposed via direct contact with blood and/or secretions of an infected person. Friends and family members are at an elevated risk when caring for the infected person through close contact with such secretions. Health care workers have also been frequently infected in medical facilities. No specific treatment or vaccine is yet available for Ebola HF but new promising drug therapies are being evaluated. Community engagement is key to successfully controlling outbreaks. Good outbreak control relies on applying a package of interventions, namely case management, infection prevention and control practices, surveillance and contact tracing, a good laboratory service, safe burials and social mobilisation. Ebola virus is known to persist in immune-privileged sites in some people who have recovered from Ebola virus disease. These sites include the testicles, the inside of the eye, and the central nervous system. In women who have been infected whilepregnant, the virus persists in the placenta, amniotic fluid and fetus. In women who have been infected while breastfeeding, the virus may persist in breast milk. 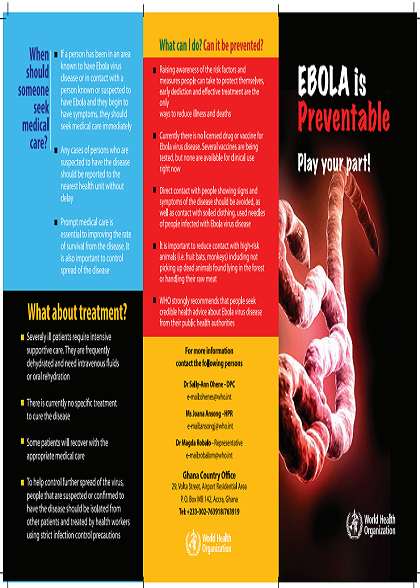 Ebola is preventable, play your part! 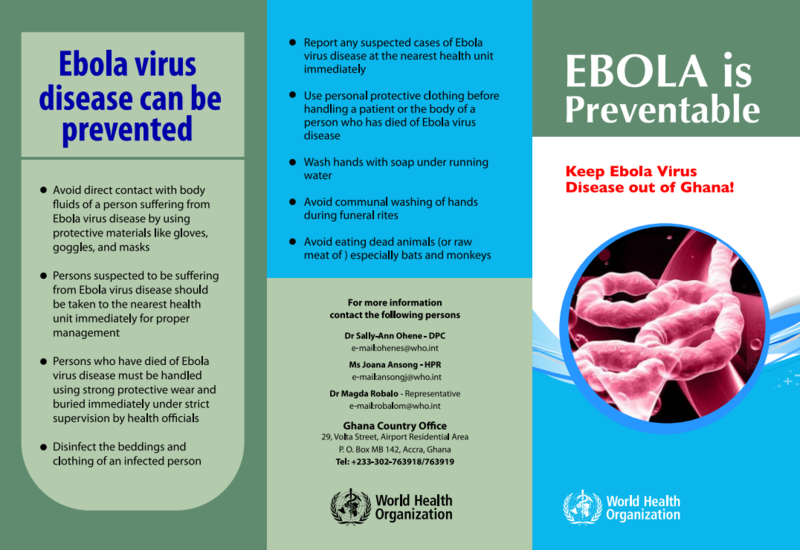 Ebola is preventable: Keep Ebola Virus Disease out of Ghana!